If you are a smartphone user then you might have noticed that when you turn on WiFi, Mobile Data gets turned Off and If you try to turn on both WiFi and Mobile Data, only one of them will give you Internet. In this article, you will find working methods to use Mobile Data and Wifi at the same time. 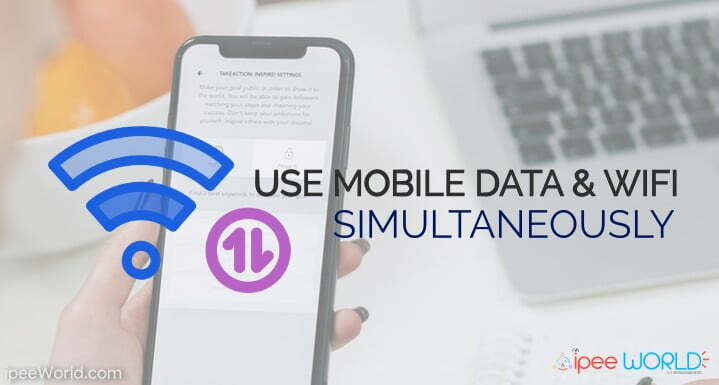 In short, after following the tips and tricks mentioned in this article, you will be able to use Mobile Data and WiFi simultaneously. Let’s say that Mobile Data is currently turned on and when you connect to any WiFi Network, Android system will automatically switch Internet to WiFi and Mobile Data will be no longer in use. But somehow, if we managed to use the Internet from both Mobile Data as well as WiFi then it will definitely increase the Download Speed and you will be able to get the combined speed of both the networks. 1.2.1 When should you use WiFi and Mobile Data together? We will be using two apps called “Super Download” and “Speedify” to combine Mobile Data and WiFi Internet. This method is applicable to both Rooted as well as Non-Rooted Android Devices. Both the apps come with Paid as well as FREE versions. The free version of both apps will have some size limitations and monthly data transfer restrictions. If you want to enjoy full features and get maximum out of it then you should consider purchasing the pro version. In this method, we will be using Speedify app. Download Links and step by step guide will be given below. Follow to get started. Step 4: Once opened, enable locations services from the prompt that appears. Step 6: Now, you will see two icons on the App’s home screen. One is Mobile Data icon and the other one is WiFi Network icon. Make sure both the options are enabled so that you can use both Internet Simulatouesly. Speedify also comes with both Pro as well as Free version. If you are happy with the results then you can consider purchasing the Pro version. But, if you only use this feature ocassionally then the free version will be enough for you. If you are looking to download files at high speed then Method 2 is what you are looking for. In this method, we will be using the app called “Super Download”. In method 1, we used Speedify to combine both Mobile Data and WiFi. This method is also going to be similar. Super Download App comes in both Free as well as Pro versions. First, you can try the lite version of the app and if you really find it useful then you can purchase the PRO version and start using it. We will be talking about the Free version in this article. The version of the app has some size limits and you are also not allowed torrent files while in this network. First of all, Head over to the Google Play Store and download “Super Download”. 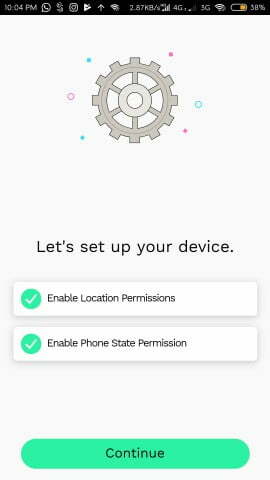 Now, from the Settings tab, Enable the option called Dual Network which will help you to bridge WiFi and Mobile Data connection together to boost Internet Speed. Go back to Home Screen and tap on the “+” button to add a new download link. Once the download process is started, you will notice a huge improvement in the download speed as the app is now using the Internet from both WiFi as well as Mobile Data. Using Super Download, you will be only able to Download files. That means you can’t browse the Internet or use both connections in any other app. If you want to Browse the Internet and also use both Network in some other applications then you should consider using Speedify mentioned in method number 1. When should you use WiFi and Mobile Data together? Let’s say that you have Internet on both Mobile as well as WiFi then if you are about to download something. The better options will be to combine both the networks so that you will be getting a good download speed than your average. If your mobile data is giving 5Mbps speed and WiFi is having another 5Mbps speed then combining both will give you a whopping 10Mbs speed, which is double the amount of speed you would get if you are using any traditional methods. In short, if you want to increase Internet Speed by bridging WiFi and Mobile Data then these apps are a perfect fit for you. This will really come in handy when you are suffering from low connectivity issues. Let’s that you are having Mobile Data with very less speed and also a WiFi connection with the same situation. In this case, you combine both the network to get decent Internet Speed. 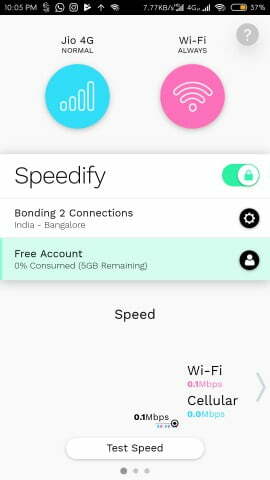 If you want to browse the Internet and use both connections everywhere on your device then you should be using Speedify app. If your primary goal is just to download files then the Super Download app will be enough for you, The free version of Super Download app comes with some limitation, so, if you want to get uninterrupted service from them consider purchasing a pro version.